In Guangdong, a Chinese province overlooking the South China Sea coast, the climate is subtropical, with mild winters and hot, muggy summers. There are also very abundant rains from April to June, little sunshine especially in spring, and possible typhoons in the warm season. In the north, in cities like Lianzhou and Shaoguan, winter is not so mild, at least if we consider the latitude: the average January temperature is around 9 °C (48 °F). Sometimes it can even snow. In summer, especially in July and August, the combination of humidity and temperature makes the heat definitely unpleasant. Here are the average temperatures of Shaoguan. In Shaoguan, 1,600 mm (63 in) of rain fall per year. The wettest period is from April to June; July and August are still quite rainy, while the least rainy season goes from autumn to the beginning of winter. Here is the average rainfall. The amount of sunshine in Shaoguan is not very good, and it is poor from January to June, while it becomes decent in July and August, but nothing more. Here are the average sunshine hours. In the center-south of Guangdong, the winter climate becomes very mild, while in the rest of the year, the temperatures are similar to those of the north, actually, they are slightly lower in summer because of the influence of the sea. In the southern part, on the coast, we find the Pearl River Delta, which is one of the most populated metropolitan areas of the planet, and includes, in addition to the two special administrative regions of Hong Kong and Macau, cities like Dongguan, Foshan, Guangzhou (or Canton), Shenzhen, Zhongshan, Huizhou, Jiangmen, Zhuhai, and Zhaoqing. Here are the average temperatures of Foshan, a metropolis located a short distance from Canton. Precipitation amounts to 1.675 mm (66 inches); as you can see, the trend is similar to that of Shaoguan and the north. In the center-south too, the sun does not shine very often, and in particular, it is rarely seen from February to April, as we can see in the following table. In the other cities of the Guangdong coast (Zhanjiang, Yangjiang, Shanwei, Shantou, Chaozhou) and in the Chuanshan Archipelago, the climate is similar to that of the Pearl River Delta. 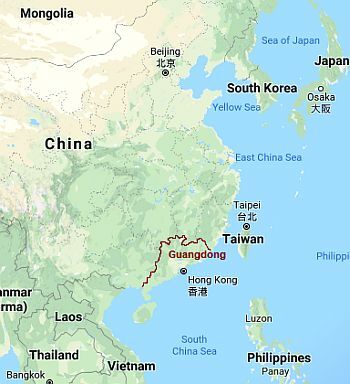 The South China Sea on the coast of Guangdong is never cold (in fact, we are at the Tropic of Cancer), even though it becomes a little cool from December to March, while it is definitely warm in summer. In the inland areas of Guangdong, we find hills and mountains. 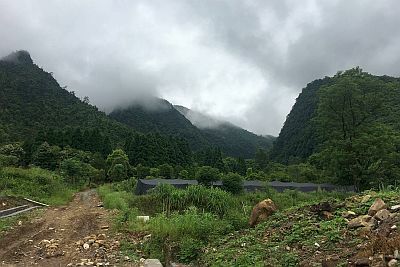 Among the peaks, in the south-west we find Datian Ding, 1,704 meters (5,590 feet) high, while in the north, in the Nanling National Forest Park, we find Shikengkong, the highest mountain in Guangdong, 1,902 meters (6,240 feet) high. It is a very humid area, covered by forests, and with streams that give life to waterfalls. As mentioned, Guangdong can be hit by typhoons, the tropical cyclones of Southeast Asia. Typically, typhoons occur in this area from June to early November, but they have sometimes affected the area outside of this period, as happened in April 2008 and in May 2006. The area most at risk is the coastal one, since it can receive the strongest winds, as well as storm surges. It is not easy to find the best period to visit Guangdong. Winter can be a good time, at least in the south and along the coast, although in the second part of the season, the sky is often cloudy, in addition, it can be windy, and sometimes, especially in the north, it can get cold. Spring is pleasantly warm, but also gloomy, and when the sun gets a little more frequent, thunderstorms also begin, then by May, the air becomes sultry and there is the risk (though still low) of typhoons. In theory, autumn is the best season, but typhoons are still possible in October, while in November, there may be windy days, and at the end of the month it can sometimes already be a bit cold. All in all, the best periods are from mid-March to mid-April, and from mid-October to late November. In winter: bring spring/autumn clothes, a sweatshirt or sweater, a jacket, a raincoat or umbrella, and a hat for colder days. In the north, add a jacket and a sweater. For the mountainous areas: bring warm clothes, a down jacket, a hat, gloves, and a scarf. In summer: bring tropics-friendly, lightweight clothing, a light sweatshirt for air-conditioned places, and a light raincoat or umbrella. For the mountains, add a sweatshirt and a light jacket.